With its equipment suspected of causing the deadliest wildfire in California history, PG&E Corp. may find its fate in the hands of someone familiar: Gavin Newsom, the former mayor of its home town. Newsom, California’s governor-elect, will take office in early January, and the aftermath of Butte County’s Camp Fire will be one of the most pressing issues on his agenda. The disaster killed at least 88 people and leveled the town of Paradise, creating a crisis for thousands of people left homeless. It also has sent shares of PG&E, the state’s largest utility, plunging and left regulators raising questions about its future — matters that Newsom, ultimately, must address. Whether he will prove to be an ally for the company is an open question. 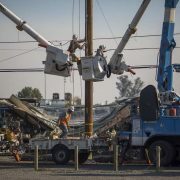 As mayor of San Francisco from 2004 to 2011, Newsom has already had to work closely with PG&E, whose ties to the city stretch back more than a century. He was considered friendly with the company, opposing efforts to create a municipal utility. In the past year, PG&E — and almost all its top executives — gave to his gubernatorial campaign. And yet, Newsom also pushed PG&E to close one of the city’s last fossil-fuel power plants. As mayor, he berated the company for repeated equipment failures that caused manhole fires, blackouts and in one case, a sidewalk explosion that left a pedestrian with severe burns. More recently, as lieutenant governor, Newsom pressured PG&E to close California’s last nuclear plant. Now the company is facing one of its gravest crises. Although no cause for the Nov. 8 Camp Fire has been determined, one of PG&E’s high-voltage transmission lines malfunctioned about 15 minutes before the fire started, in the same area where investigators say the flames began. The utility’s equipment has already been blamed for starting 17 of last year’s Northern California wildfires, which together killed 44 people, and survivors of this month’s blaze have filed suit against the company. PG&E faces an estimated $17 billion in liabilities for the 2017 fires, and CoreLogic Inc. expects losses from the Camp Fire to reach as high as $13 billion. While one state lawmaker plans legislation to help the company deal with any costs arising from the Camp Fire, another wants it broken up. And the state’s utilities commission is exploring whether PG&E needs to be restructured, or possibly split into pieces. Newsom hasn’t taken a stand on the proposed legislation, and his staff declined to make him available for this story. He will, however, have to get involved, even if public anger at PG&E makes that perilous, said Dan Schnur, a veteran California political analyst. PG&E declined to comment specifically on its relationship with Newsom. But Lynsey Paulo, a spokeswoman for the company, said it makes a point of working with many politicians. “PG&E holds itself to the highest ethical standards of public disclosure and compliance, and we participate in the political process, working with elected officials at all levels on a variety of matters that are important to our state and local communities,” she said. Newsom’s predecessor, Jerry Brown, was seen as an ally for the state’s utility companies, whose help he needed to boost the use of renewable power and fight climate change. One of his closest aides — Nancy McFadden, who died this year — had previously worked for PG&E. The governor’s sister, Kathleen L. Brown, sits on the board of another California utility owner, Sempra Energy. Newsom, a centrist Democrat and San Francisco native, was among many of the city’s political leaders who were “cozy” with PG&E, said Tom Ammiano, who served more than a decade on the board of supervisors before winning a state Assembly seat. (Ammiano is also a Democrat but hails from a further left-leaning faction of the party than Newsom.) The company, whose Pacific Gas and Electric Co. utility was founded in the city in 1905, had long been considered the 500-pound gorilla of local politics and remains one of San Francisco’s largest employers. Newsom sided with PG&E to oppose a 2008 ballot measure that would have increased San Francisco’s use of renewable power — and given city officials the ability to set up a municipal utility on PG&E’s home turf. The campaign against the measure was led by one of Newsom’s advisers at the time, who had also worked with PG&E. But Newsom insisted that the adviser kept the interests of his clients separate. But while Newsom was mayor, the city sued to stop a 2010 statewide ballot measure sponsored by PG&E that would have made it far more difficult for California cities and counties to get into the electricity business. The city couldn’t keep the initiative off the ballot, but voters defeated it, even after PG&E spent $46 million on the campaign. 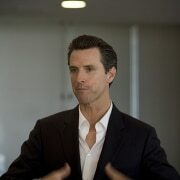 As lieutenant governor, Newsom used his leverage as chairman of the State Lands Commission to pressure PG&E into closing its Diablo Canyon nuclear plant, which is almost surrounded by earthquake faults. The utility, already worried that a flood of cheap renewable power could soon render the plant unprofitable, decided to retire it. The commission extended the leases long enough to ensure the orderly closure of the plant, now scheduled to shut down in 2025. The debate over Diablo Canyon didn’t prevent PG&E from donating to Newsom’s successful run for governor. The company this year gave $58,400, according to state records, while its executives added $41,500. Chief Executive Officer Geisha Williams pitched in $10,000. Newsom raised $47.5 million for his campaign, according to data from the California Secretary of State. Nathan Ballard, who served as Newsom’s spokesman during much of his tenure as mayor, said Newsom always insisted that the company resolve its problems rather than pushing for its breakup. Such problems included replacing aging infrastructure in San Francisco that, several times, caught fire or caused blackouts. “He was always very aggressive about making sure PG&E got it done right,” Ballard said. Ballard, who said he talks to the governor-elect regularly but won’t be part of the incoming administration, said he has “no doubt” Newsom would tackle the issue of wildfires and utility liability. “It will be driven by Governor Gavin Newsom,” Ballard said. Embattled PG&E Has Long History With California’s New Governor, by David R. Baker, Bloomberg, December 2, 2018.